I went to gym yesterday to have personal training and a complimentary simplicity consultation. 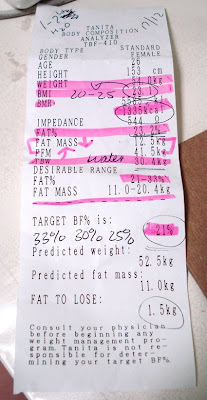 After a long chat about what I should cut down and what I should eat, I did a check up for mass body fat in a Tanita Body Fat Analyzer and this is my result. I'm in the middle of everything. Not Obese, not Anorexic! But to have a better looking body, I should lose 1.5kg. Then it will be perfect. Thats what the machine said, but I think I need to lose more :P cuz I ate too much! Damn you yummy food.